"The Mirai, Stage 2 Course Book is a high-energy, full-color textbook that offers a fun but challenging approach to learning the Japanese language. This book continues the second stage of study for beginning learners of Japanese. Written for a mixed-ability classroom, Mirai features clear explanations of language structures, idiomatic expressions and appropriate language use. Chapters focus on everyday situational topics such as communicating with and about your family, friends, and pets. Each of the four “parts” to the textbook, for a total of ten units, begin with a “Learning Outcomes” section that helps to focus the lesson and an “I did it!” section at the end gives students a sense of accomplishment. The units include: an “Explanation Corner” that explains key concepts and expressions, group and individual activities, study hints, information on Japan, katakana practice, vocabulary lists, and much more. Comics and games accompany learning along the way. Authentic and up-to-date photos and maps are also presented in context so that students gain an appreciation of Japanese culture as well as language. In Stage 2, students learn the entire katakana syllabary with an average of eight katakana and two or three kanji introduced per lesson. As students should know hiragana from Stage 1, romaji only appears under new katakana syllables. " "The Mirai, Stage 2 Audio CDs contain listening material for the Stage 2 Course Book, Activity Book, and Teacher’s Book. 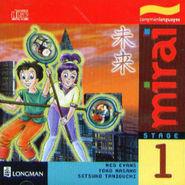 This set of two CDs contains audio material for the ten storyboards which begin each unit, along with the nine e-mail sections, sixteen listening tasks, eight language example tracks, eighteen listening activities from the Activity Book, 1-2 listening tests per unit, and two songs and plays. The Audio CDs are designed for use with the books in the series and offer a great resource for listening and speaking practice. " "The Mirai, Stage 2 Activity Book gives students the chance to practice and implement what they’ve learned in the classroom. The Activity Book accompanies the beginning level Stage 2 Course Book and features practice sheets for copying katakana and kanji, further reading and writing activities, puzzles, and homework exercises and tasks. Used with the Mirai Stage 2 Audio CDs, the Activity Book also offers reinforcement exercises for listening and speaking. Great for in class, out of class, or self-study use, the Activity Book embodies the interactive and communicative approach of the Mirai series. " "The Mirai, Stage 1 Teacher’s Book offers ideas for interactive classroom activities as well as informative pedagogical assistance. Each unit in the Teacher’s Book corresponds to the Course Book and offers support material for the Activity Book. The units include suggestions for sequencing lessons, listening texts, flashcards, further group activities, answers to the Activity Book puzzles, helpful links to online resources, and sample tests. The perfect teaching aid for any classroom using the Mirai series! " "The Mirai, Stage 1 Course Book is a high-energy, full-color textbook that offers a fun but challenging approach to learning the Japanese language. This book starts the first stage of study for beginning learners of Japanese. Written for a mixed-ability classroom, Mirai features clear explanations of language structures, idiomatic expressions and appropriate language use. Chapters focus on everyday situational topics such as introducing yourself and others, school life, and telling the time. The three “parts” to the textbook, each with three units, begin with a “Learning Outcomes” section that helps to focus the lesson and an “I’ve Got it!” section at the end gives students a sense of accomplishment. The units include: an “Explanation Corner” that explains key concepts and expressions, group and individual activities, study hints, information on Japan, hiragana practice, and much more. Comics, music, and games accompany learning along the way. Authentic and up-to-date photos and maps are also presented in context so that students gain an appreciation of Japanese culture as well as language. This special version of Stage 1 does not contain any romaji. The other version uses a unique color overlay sheet to encourage students to read hiragana even when romaji is provided. Directions and explanations feature a balance of English and Japanese to encourage tackling activities with confidence! " "The Mirai, Stage 1 Course Book is a high-energy, full-color textbook that offers a fun but challenging approach to learning the Japanese language. This book starts the first stage of study for beginning learners of Japanese. Written for a mixed-ability classroom, Mirai features clear explanations of language structures, idiomatic expressions and appropriate language use. Chapters focus on everyday situational topics such as introducing yourself and others, school life, and telling the time. The three “parts” to the textbook, each with three units, begin with a “Learning Outcomes” section that helps to focus the lesson and an “I’ve Got it!” section at the end gives students a sense of accomplishment. The units include: an “Explanation Corner” that explains key concepts and expressions, group and individual activities, study hints, information on Japan, hiragana practice, and much more. Comics, music, and games accompany learning along the way. Authentic and up-to-date photos and maps are also presented in context so that students gain an appreciation of Japanese culture as well as language. Stage 1 uses a unique color overlay sheet to encourage students to read hiragana even when romaji is provided. A totally romaji-free version is also available. Directions and explanations feature a balance of English and Japanese to encourage tackling activities with confidence! " 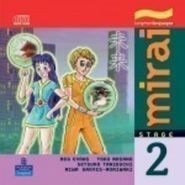 "The Mirai, Stage 1 Audio CD contains listening material for the Stage 1 Course Book, Activity Book, and Teacher’s Book. This single CD contains audio versions of the cartoons, manga, and listening activities in the course book, listening material for exercises in the activity book, songs and plays, and dialogues from unit storyboards. The audio CD is designed for use with the books in the series and for listening and speaking practice. " "The Mirai, Stage 1 Activity Book gives students the chance to practice and implement what they’ve learned in the classroom. The activity book accompanies the beginning-level Mirai, Stage 1 Course Book and features practice sheets for copying hiragana and kanji, further reading and writing activities, puzzles, and homework exercises and tasks. Used with the Mirai, Stage 1 Audio CD, the activity book also offers reinforcement exercises for listening and speaking. Great for in class, out of class, or self-study, the activity book embodies the interactive and communicative approach of the Mirai series. " Living Japanese: Diversity in Language and Lifestyles (Ikita Nihongo: samazama na kotoba, samazama na seikatsu) draws students into the lives of thirty-three Japanese from ages seven to seventy-five. As students listen to diverse viewpoints on cultural and social issues, they will develop an extensive vocabulary and become accustomed to natural speech and linguistic differences. For All Students This flexible book and audio program features 101 Japanese idiomatic and proverbial expressions that enrich students knowledge of Japanese language and culture. Each left-hand page provides the expression in Japanese orthography and romanization, along with a whimsical illustration. Each right-hand page provides a literal translation of the idiom, its definition, cultural notes, and a dialogue in Japanese orthography, Roomaji, and English. Audiocassettes include expressive readings of the dialogues to help improve students' pronunciation.